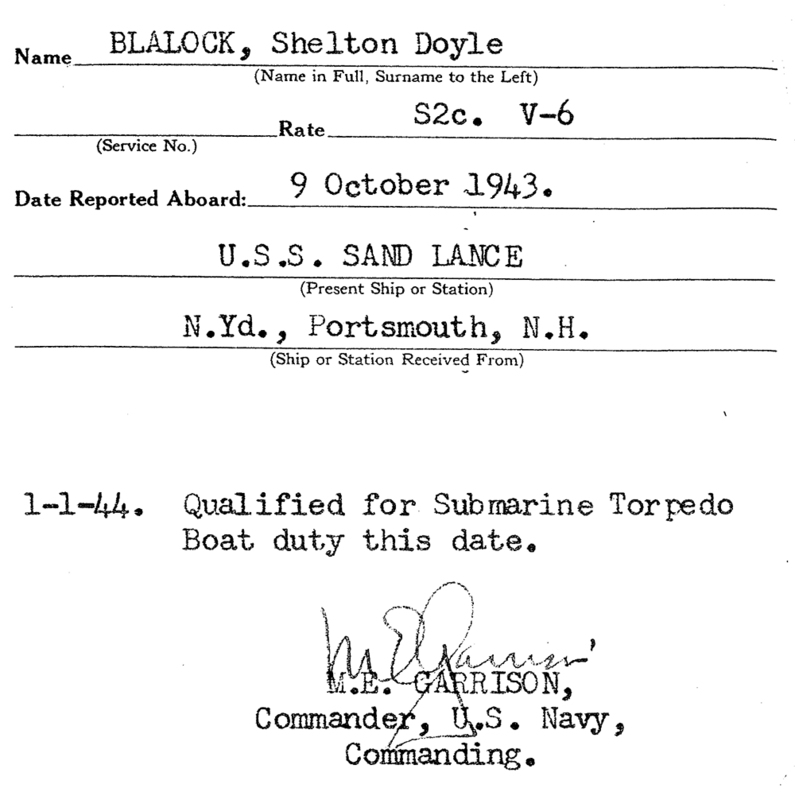 On September 24, 1942, Shelton Doyle Blalock went into active service with the Navy. 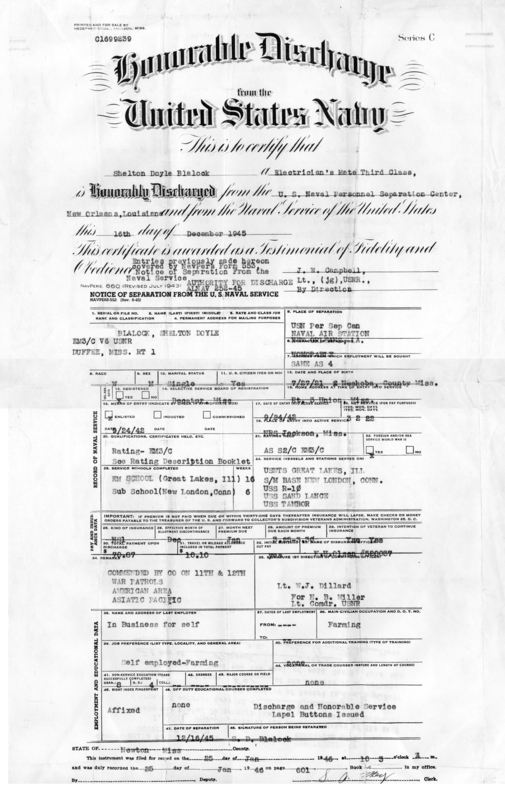 He spent 16 weeks at the U.S. 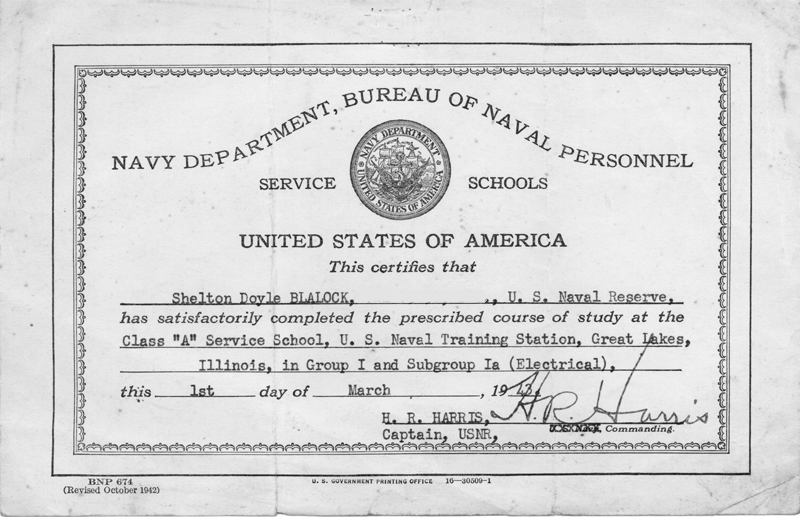 Naval Training Station in Great Lakes, Illinois training to become an Electrician's Mate. 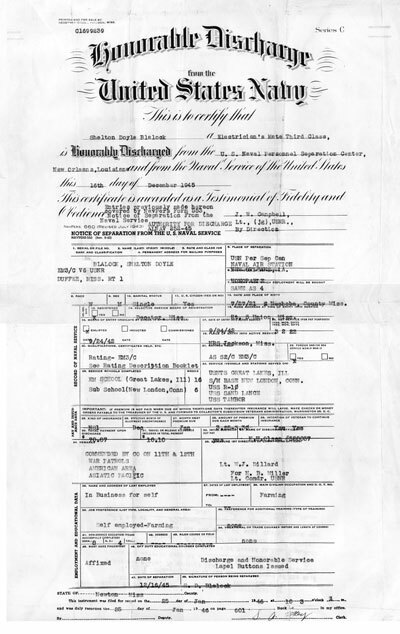 I have found records where he was admitted into U.S.N. 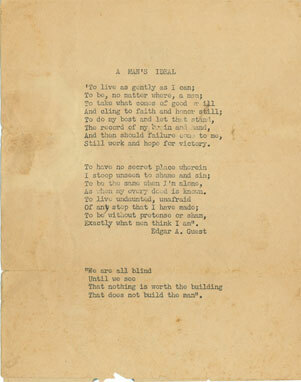 Hospital, Great Lakes, Illinois on December 8, 1942 and was released on December 16, 1942. Nothing was stated as to why he was in the hospital. I believe this is the time that a piece of glass in his foot began giving him trouble. 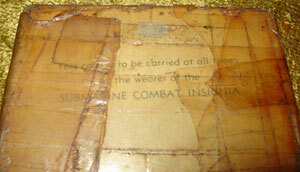 He had a piece of glass surgically removed from his foot sometime while in service. Here is his Bluejackets' Manual, 1940, 10th Edition. It's what he used in training at the U.S. 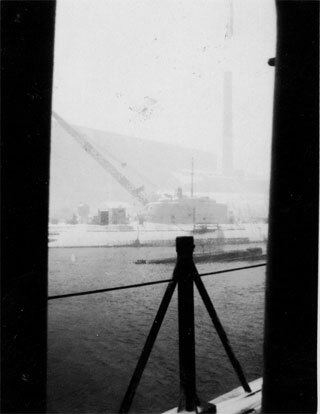 Naval Training Station. 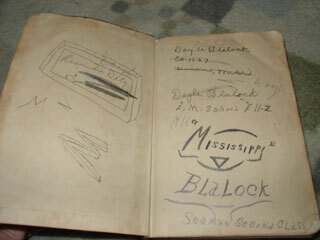 "Mississippi" Blalock, Seaman 2nd Class. The writing says "On Feb 25 Sec. 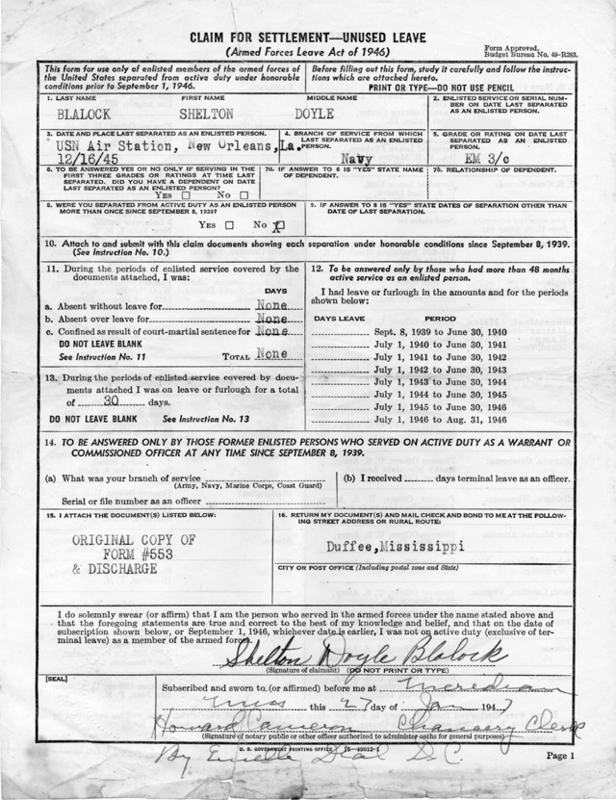 E 11-2 left Barracks 608 (Service School Barr) for O.G.U. I lost all my money in a poker game. So here's luck to me. - S.D.B. 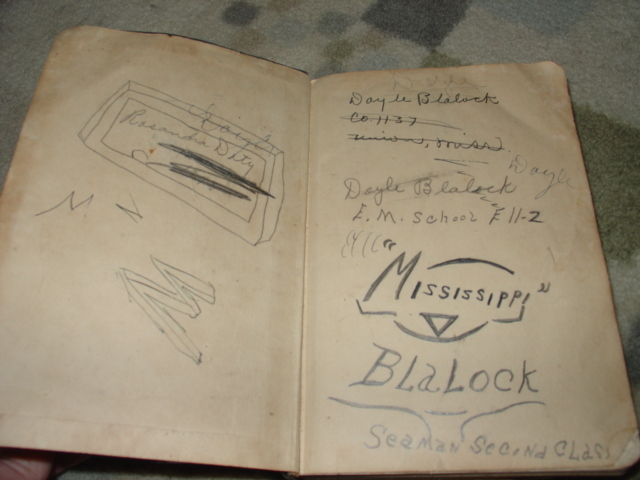 'Mississippi'". 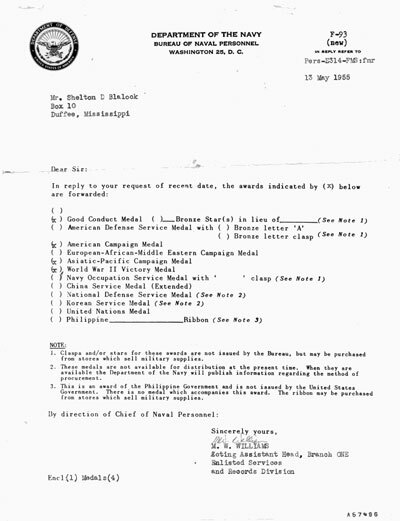 Section E-11-2 must have been nicknamed "Caldwell's Chow Hounds". 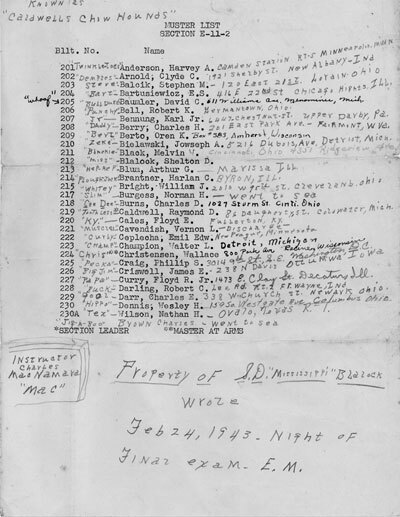 Doyle wrote down all the nicknames of his classmates as well as addresses, perhaps with hopes of contacting them again someday after the war. Notice here he has picked up the nickname "Miss" or "Mississippi". Later, perhaps in Submarine School, he gets the nickname "Steve", which is a result of saying "S.D." (Shelton Doyle) really fast really often. He completed electrician's training on March 1, 1943. 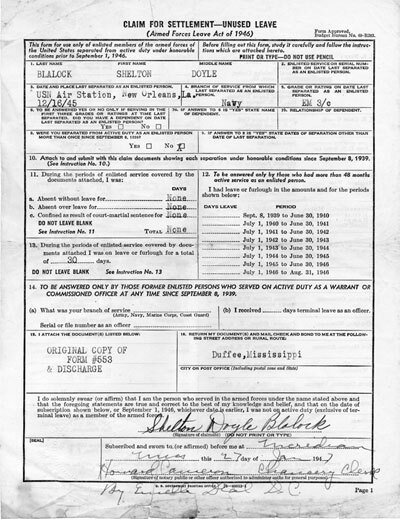 Upon graduation from the U.S. 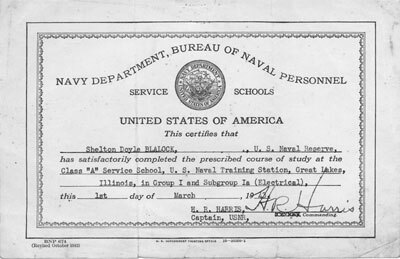 Naval Training Station in Great Lakes, Illinois, he volunteered for submarine service. 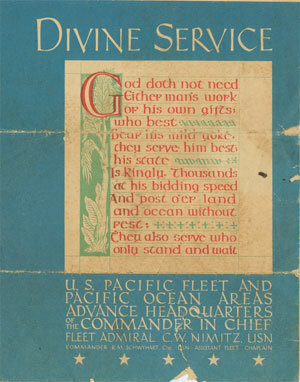 Submarine service is a volunteer-only service. 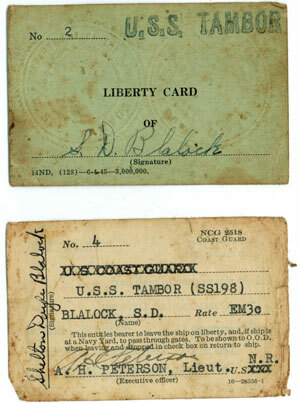 Submariners did get better pay, better food, and better treatment/liberty, but casualties were high. I recall Papaw saying "If I was gonna get paid to die, I might as well make the most money I could while doing it!". 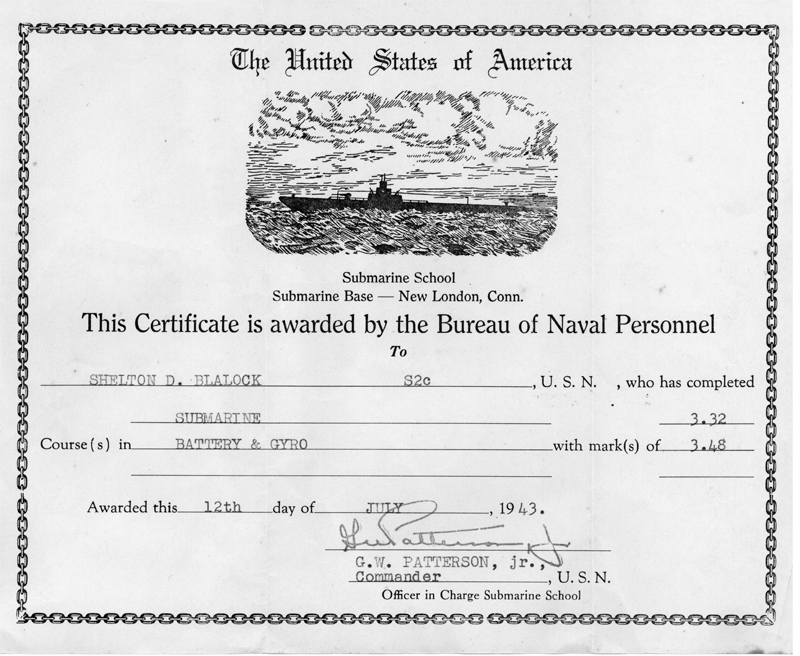 The next 6 weeks he trained at New London, Connecticut in the Submarine School there. 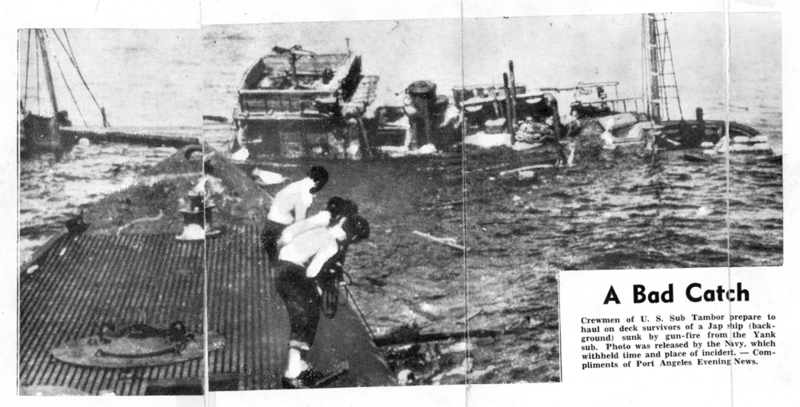 If you've never read about how difficult the submarine training was back then, you should read up on it. 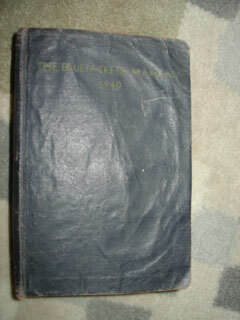 Very few seamen could get into Submarine School, and once there many more couldn't take the training, some even died! Doyle completed submarine training at New London, CT, on July 12, 1943. 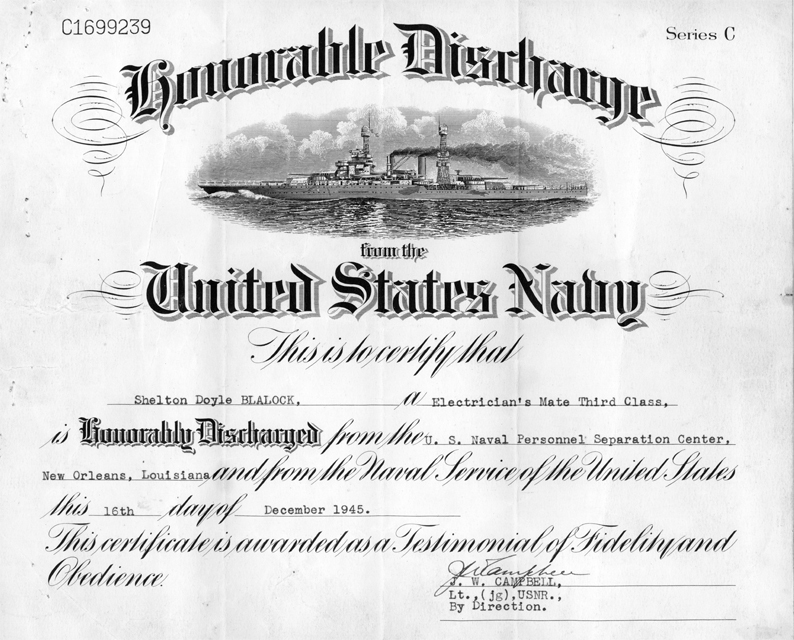 According to his discharge papers, he served on the USS R-10 (SS-87) from July 15, 1943 until August 11, 1943. The R-10 was a training submarine. His first war submarine was the brand new Balao-class USS Sand Lance (SS-381). 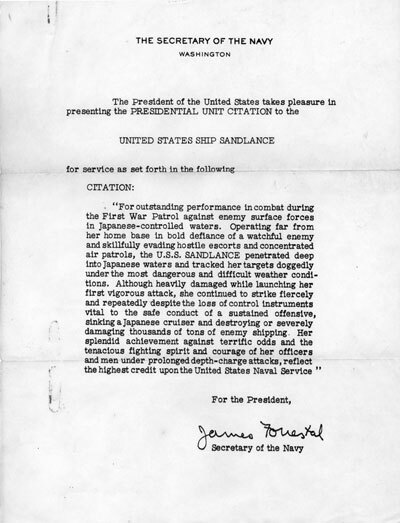 She was commissioned on October 9, 1943 at Portsmouth, New Hampshire and Doyle was there. 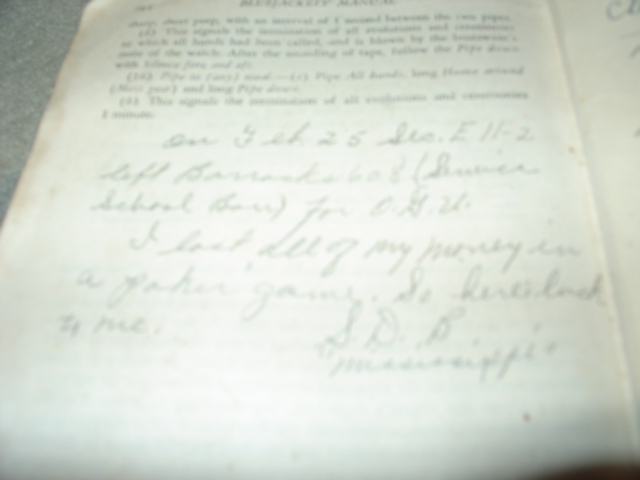 She was tested and trained upon out of New London, Connecticut for a couple of months before leaving. 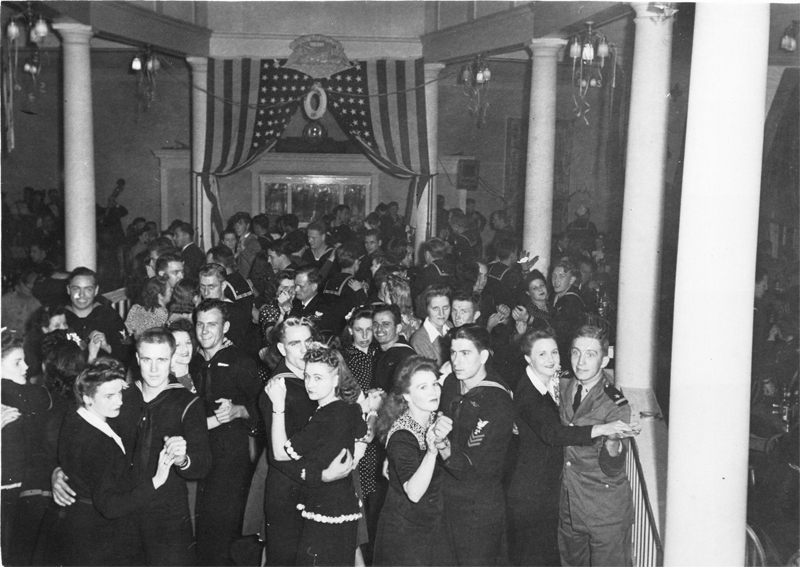 Sometime before the USS Sand Lance left the east coast, there was a party. 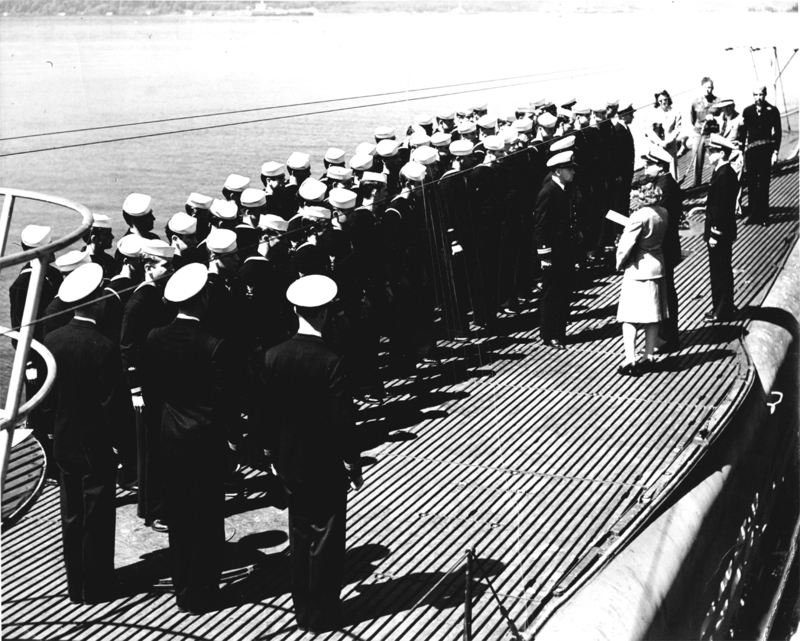 Here is the commissioning crew of the SS-381. 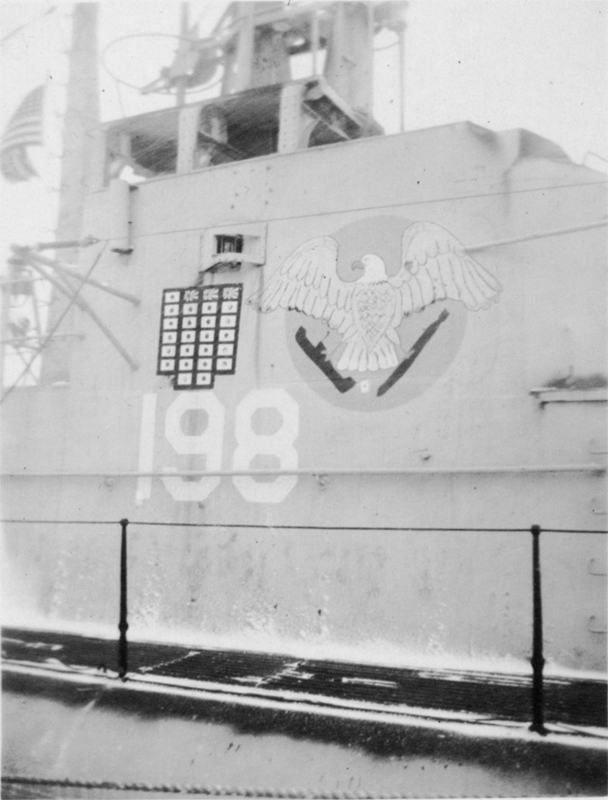 We believe Doyle can be spotted in the back center, nearly straight below the hanging USS Sand Lance life preserver. 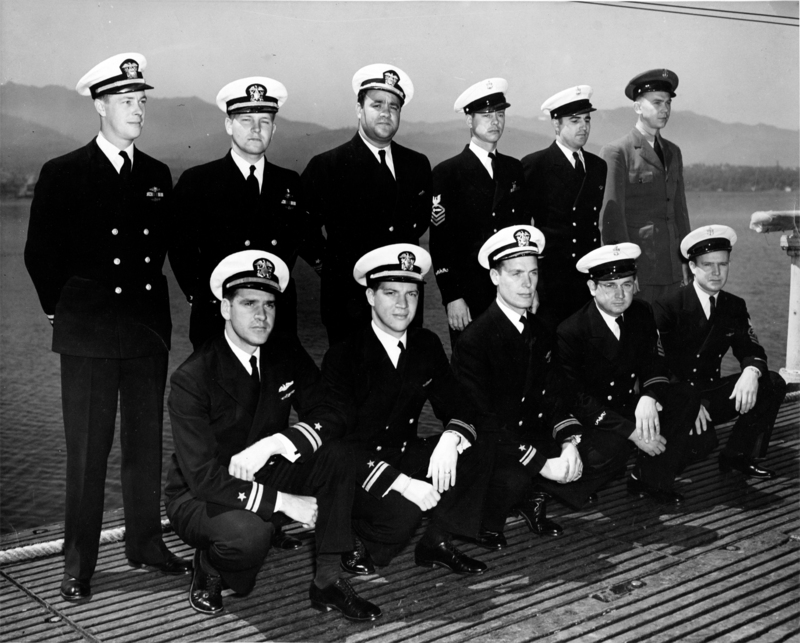 Above are the commissioning officers of the SS-381. What a party they had before they left! On December 18, 1943, the SS-318 left the east coast for war in the Pacific. The Sand Lance passed through the Panama Canal on December 30, 1943 and finally reached Pearl Harbor, Hawaii, on January 17, 1944. 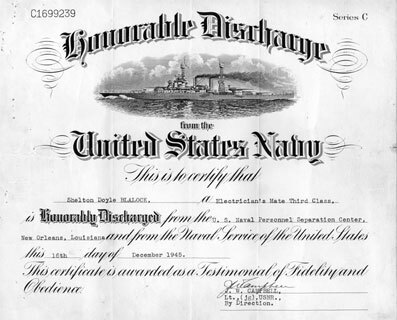 Just before reaching Pearl Harbor, Doyle became qualified (SS) in submarines on January 1, 1944. This was a major accomplishment for any submariner. This is a tough process that took around 6 months. 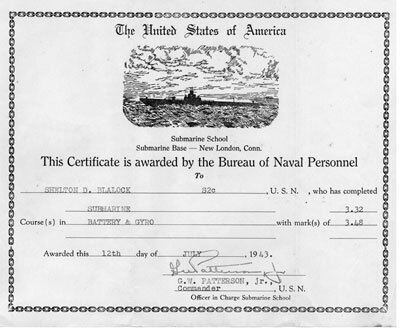 Once a submarine sailor is "qualified in submarines" this means he can perform damage control anywhere in the boat and has a basic knowledge of every system on board. When qualified, they earn their "dolphins", which in WWII days was a patch worn on their right arm halfway between their elbow and wrist. Officers wore gold dolphins as a pin on their chest. 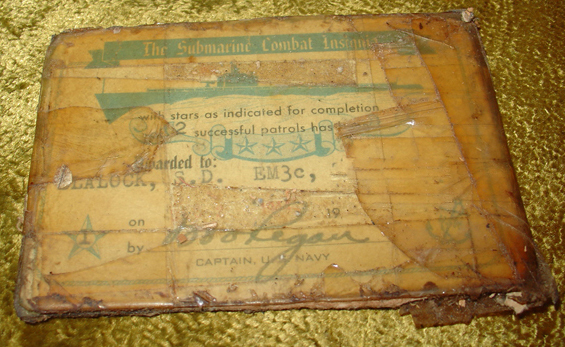 To a WWII submariner, their dolphin patch and their Submarine Combat Patrol Pin meant the world to them. The picture above is what his "dolphins" would have looked like as sewn onto his right sleeve on a blue uniform. 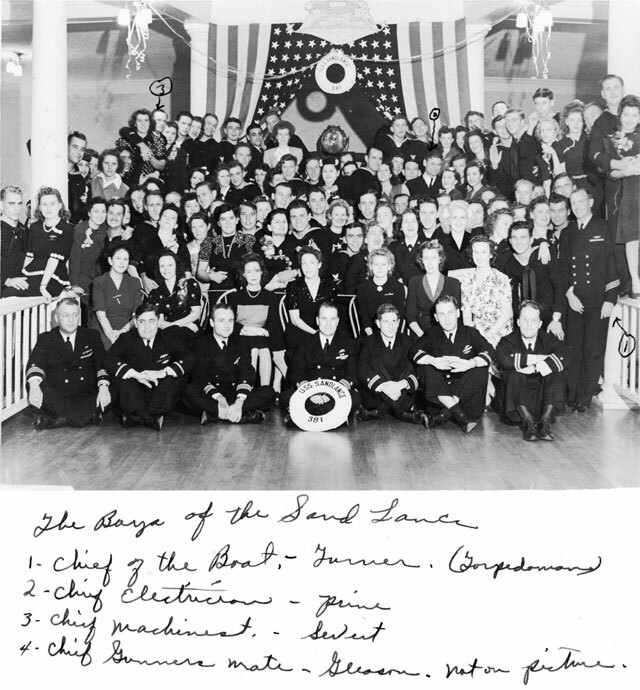 The Sand Lance left Pearl Harbor for Midway Island on February 8, 1944. Doyle discovered that a cyst had developed where he'd had a tooth pulled prior to the entering the Navy, and the cyst would make his entire head swell up while submerged for prolonged periods. The pharmacist mate of the Sand Lance decided it was best to leave him at Midway until his cyst was fixed. 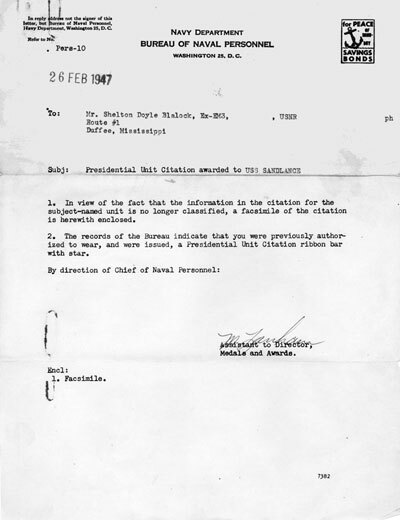 So, on February 14, 1944, Doyle was placed off the Sand Lance at Midway. He never got to see combat action aboard the brand new submarine. 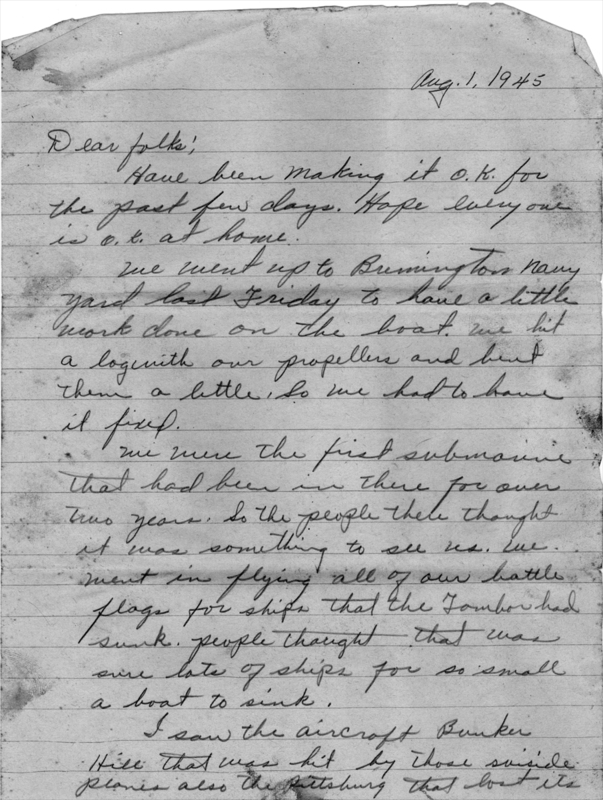 The Sand Lance left Midway the following day, February 15, 1944, and Doyle stayed behind. Time went by. His cyst was taken care of. 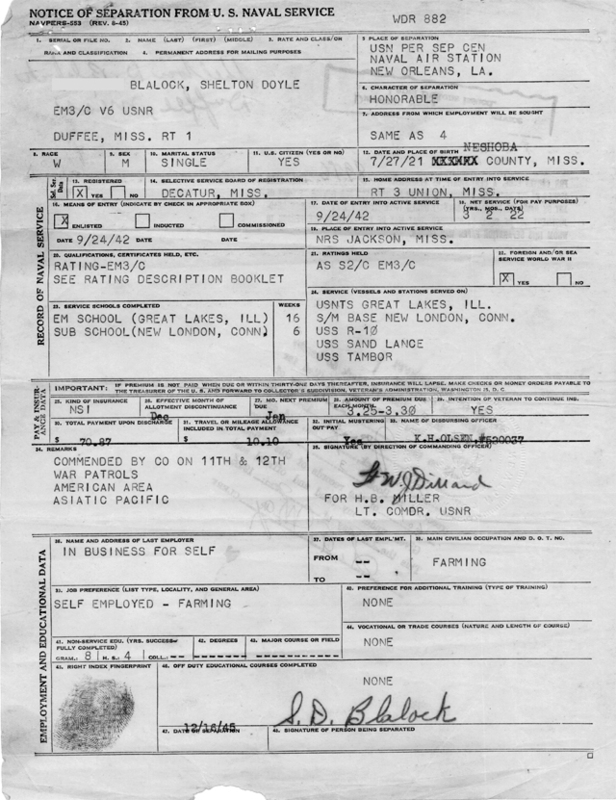 He inquired everyone about the Sand Lance and learned she was off the coast of Australia (indeed the Sand Lance was in Fremantle, Australia, in early June of 1944). 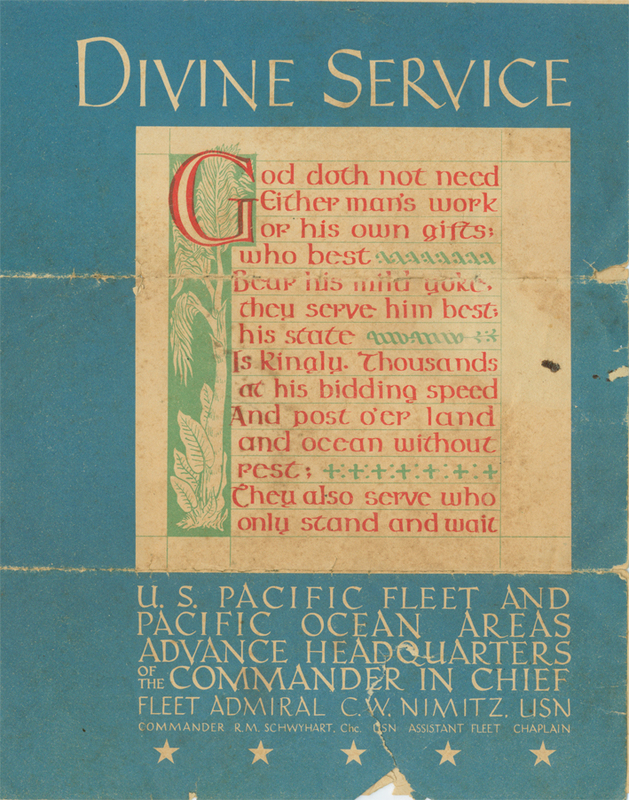 He worked on a relief crew (maintenance and repair of Naval vessels as they came into port for refitting) during the time that passed by on Midway Island. 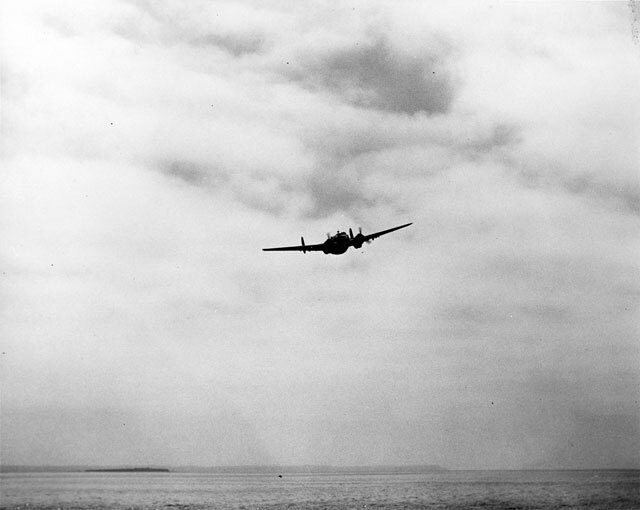 Doyle remained on Midway Island. 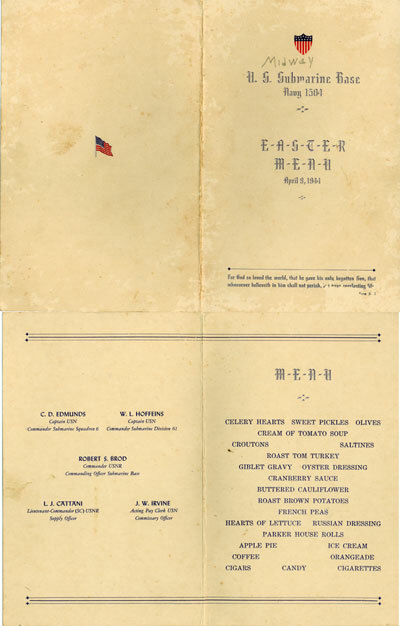 At least the food sounded good for that Easter on April 9, 1944. 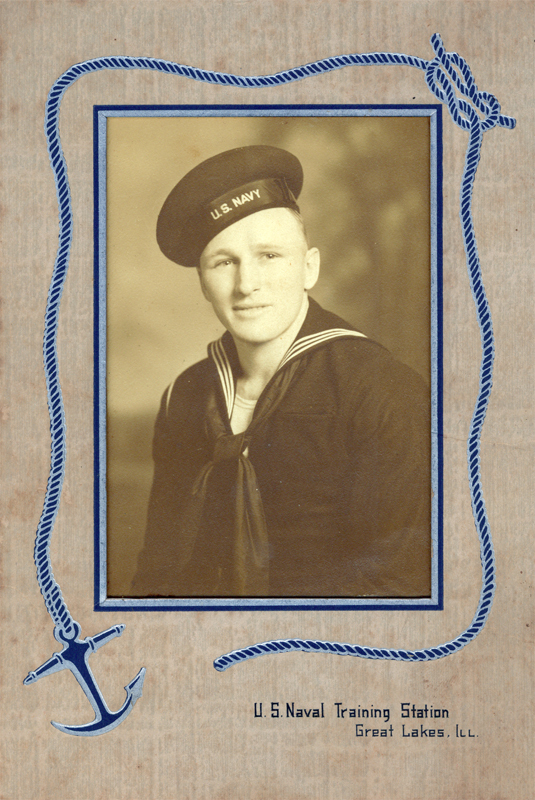 He received orders to join the USS Tang (SS-306) which was to stop briefly at Midway on June 12, 1944 for a refuel and minor repairs after leaving Pearl Harbor on June 8, 1944. This was the beginning of the Tang's 3rd war patrol. Doyle knew of the commander of the Tang, Richard O'Kane. 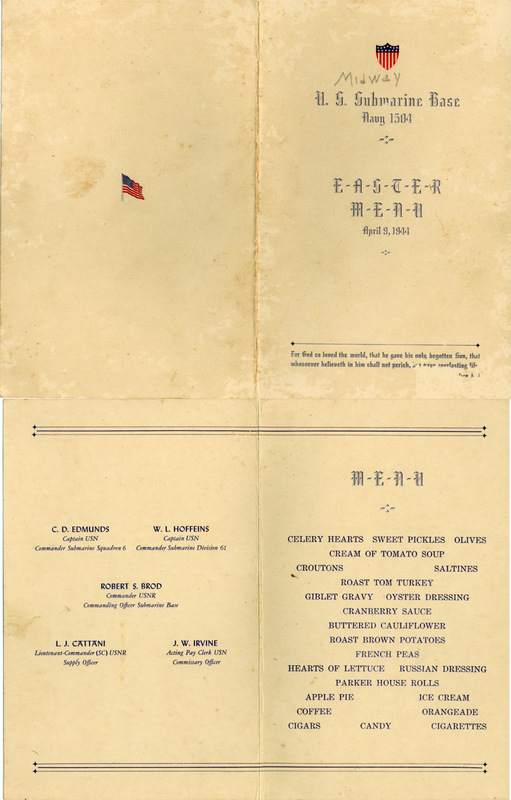 O'Kane was executive officer to Mush Morton on the USS Wahoo, which sank just after O'Kane was detached to become Tang's commander. He thought O'Kane would be reckless and on a revenge mission. 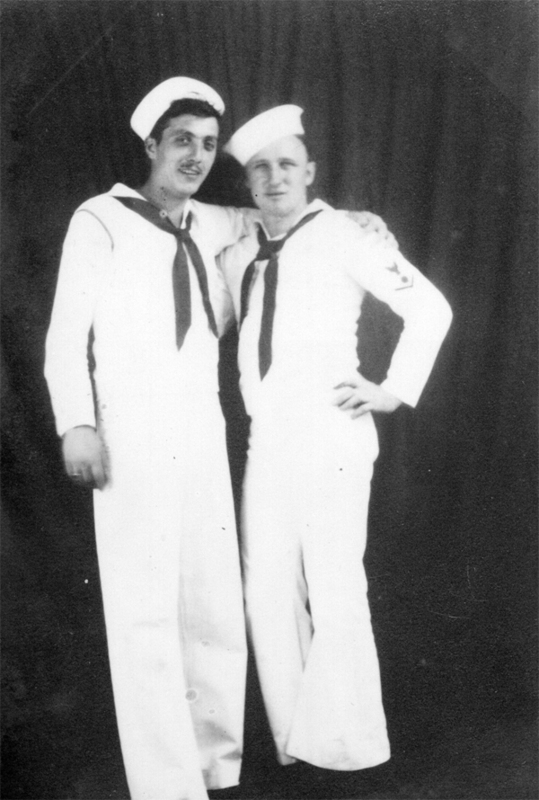 Another electrician's mate (a young man from Arkansas), who was set to join the USS Tambor (SS-198), wanted to swap with Doyle, as he felt the Tang would go down in history under O'Kane's leadership. The swap was approved, and the Tang indeed did go down in history on her 5th war patrol. "He (Richard O'Kane) was captured by the Japanese when his boat was sunk in the Formosa Strait by its own flawed torpedo (running in a circle) during a surface night attack on October 24 - October 25, 1944, wherein he lost all but eight of his crew, and was secretly (i.e. illegally) held prisoner until the war's end some ten months later. 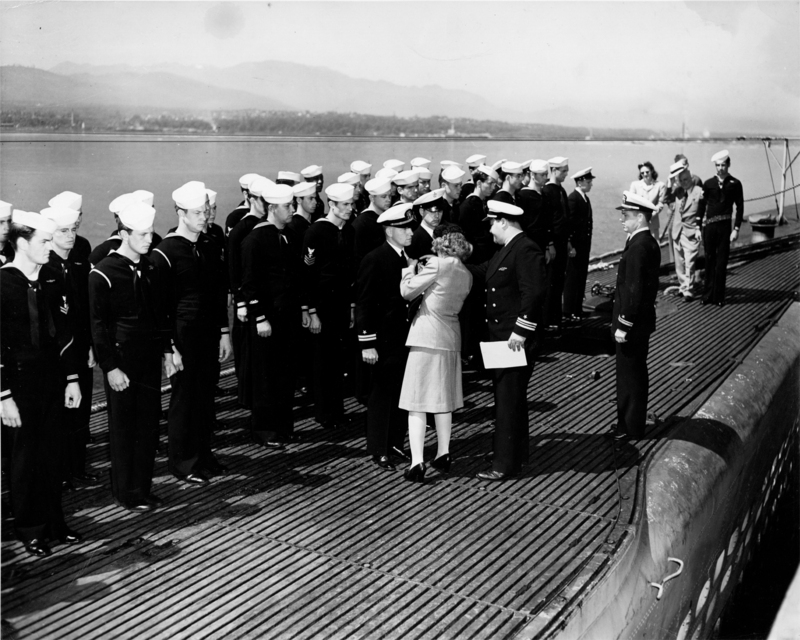 Following his release, Commander O'Kane was awarded the Medal of Honor for his "conspicuous gallantry and intrepidity" during his submarine's final operations against Japanese shipping." 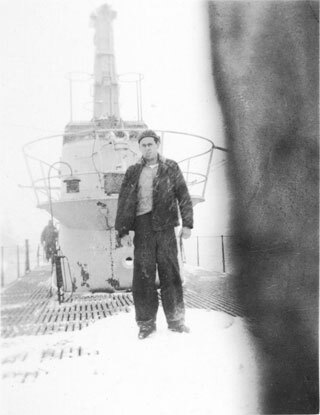 The electrician's mate that swapped places with Doyle (if he was still with the Tang for that 5th war patrol) was not one of the 8 crewmen that survived. In fact, the circular-running torpedo hit between the after torpedo room and the maneuvering room, and I understand that electricians spent a lot of time in the maneuvering room. 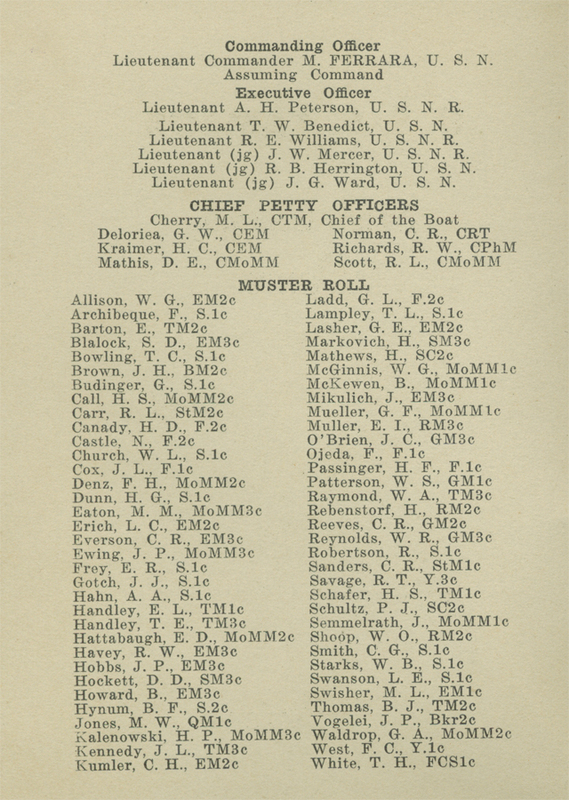 Most crewmen served 4 consecutive war patrols before being transferred. O'Kane later wrote two excellent books about his WWII service, Clear the Bridge! 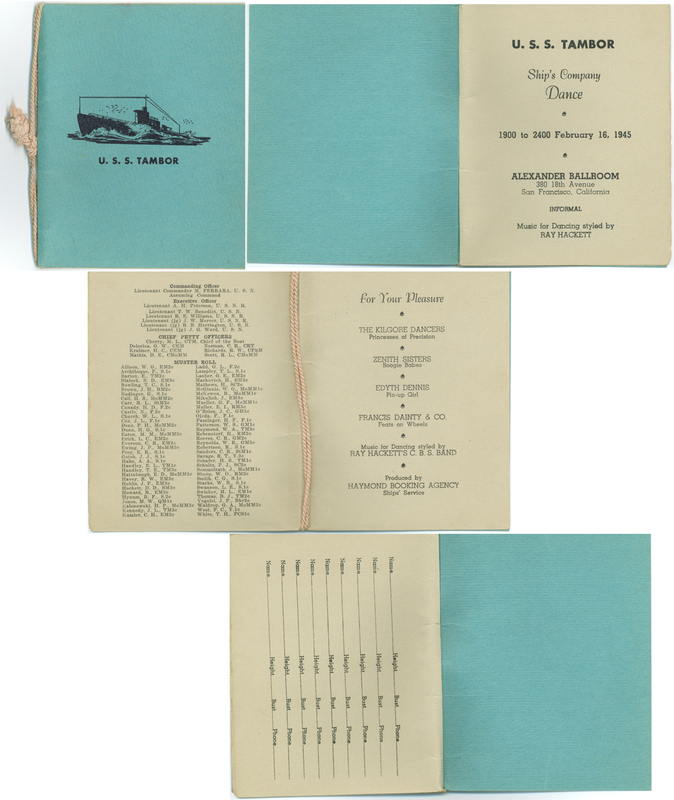 : The War Patrols of the USS Tang and Wahoo: The Patrols of America's Most Famous World War II Submarine. They are great reads! Richard O'Kane is remembered as one of the most successful, aggressive submarine captains of WWII. 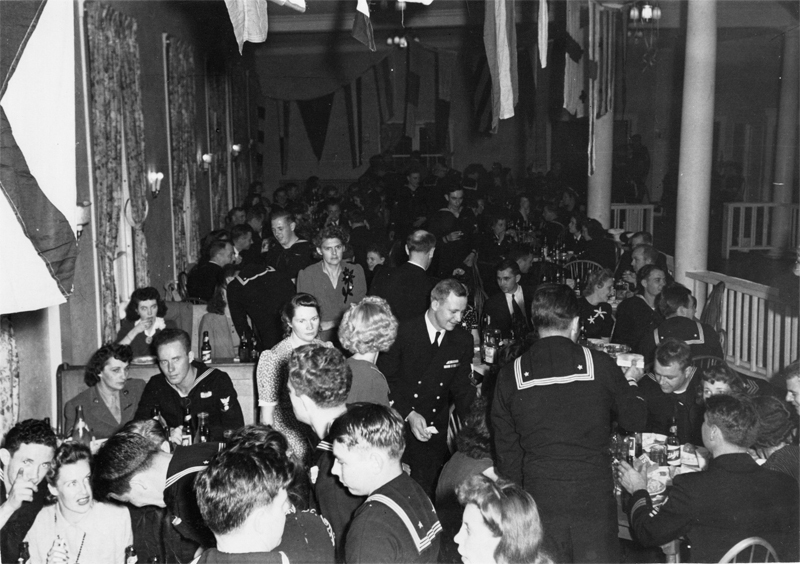 Late on the night of June 2, 1944, an older Tambor-class submarine named USS Tambor (SS-198) came into Midway from her 10th war patrol. 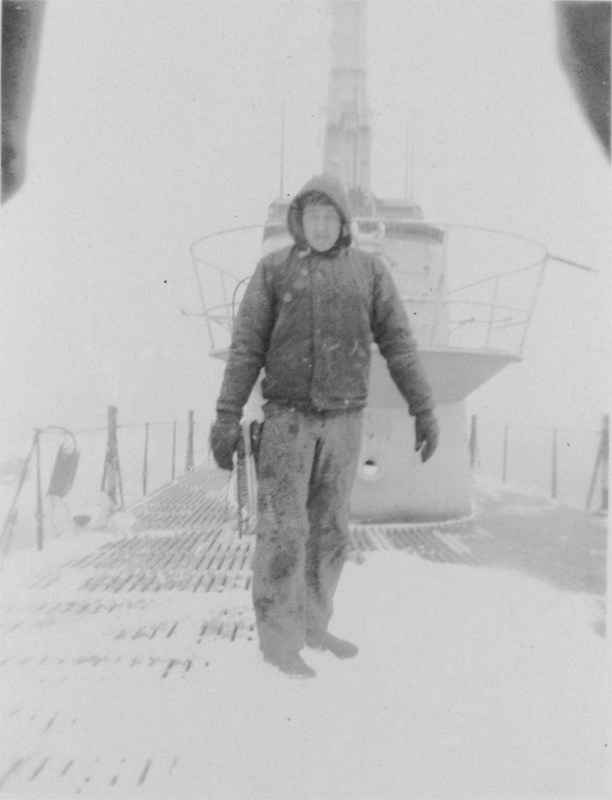 Doyle had swapped with the electrician who was now set to leave on the Tang on June 12, 1944. So, Doyle's new home was finally in a submarine, the Tambor. After a refit (completed June 17, 1944) which included new propellers, Tambor went to sea for training on June 17, 1944, only 5 days after the Tang had left Midway on her 3rd war patrol in the East China Sea. Many of the Tambor's crew was inexperienced, including Doyle. 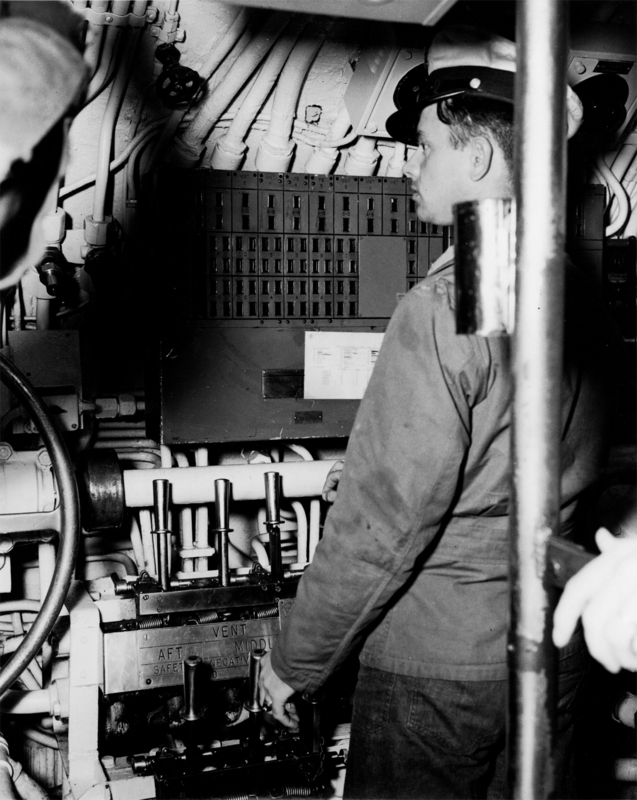 A fire broke out in the engine room, destroying many of the cables and delaying their next war patrol further. 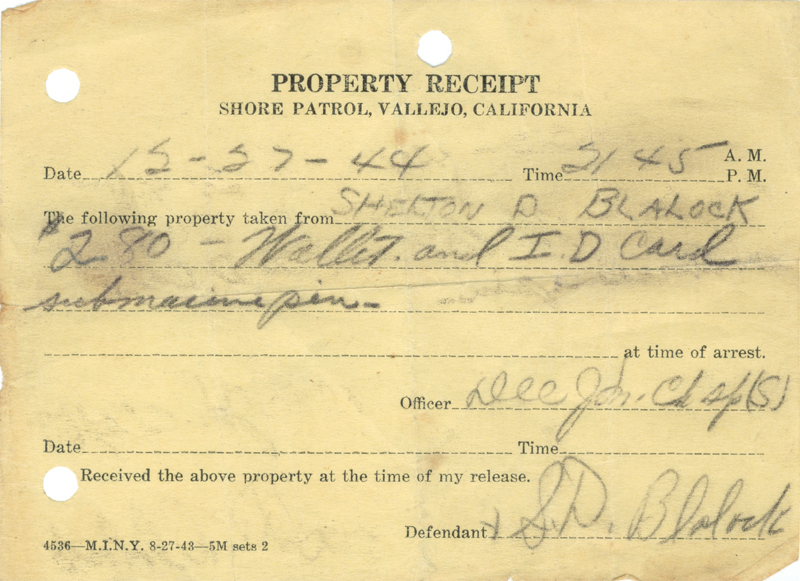 The 11th patrol got underway on July 16, 1944. Doyle was finally going to earn his Submarine Combat Patrol Pin! 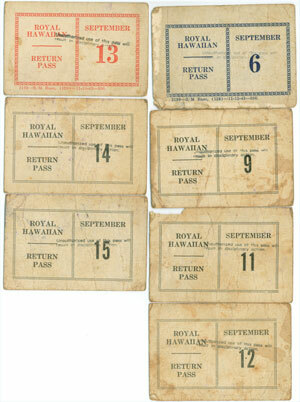 Tambor's 11th war patrol ended on September 1, 1944 at Pearl Harbor after a brief refuel at Midway August 27-28, 1944. She had fired 11 of her 24 torpedoes and sank 6,000 tons of shipping on this patrol. I have acquired exact copies of all of the Sand Lance and Tambor war patrol reports if you have questions. 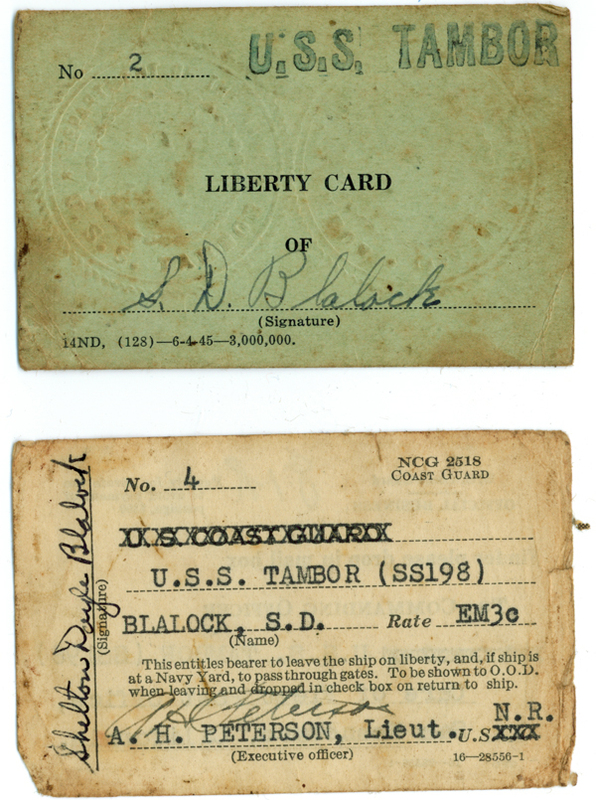 Between the 11th and 12th war patrols, the USS Tambor spent a couple of weeks at Pearl Harbor for a refit. 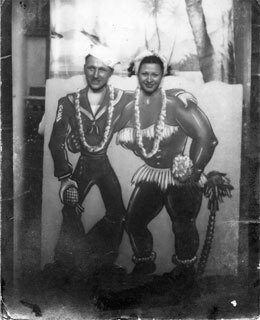 This meant Doyle finally got to visit The Royal Hawaiian, a hotel/resort that was reserved just for submarine sailors during WWII. The pictures above were taken there. The refit was completed on September 15, 1944. 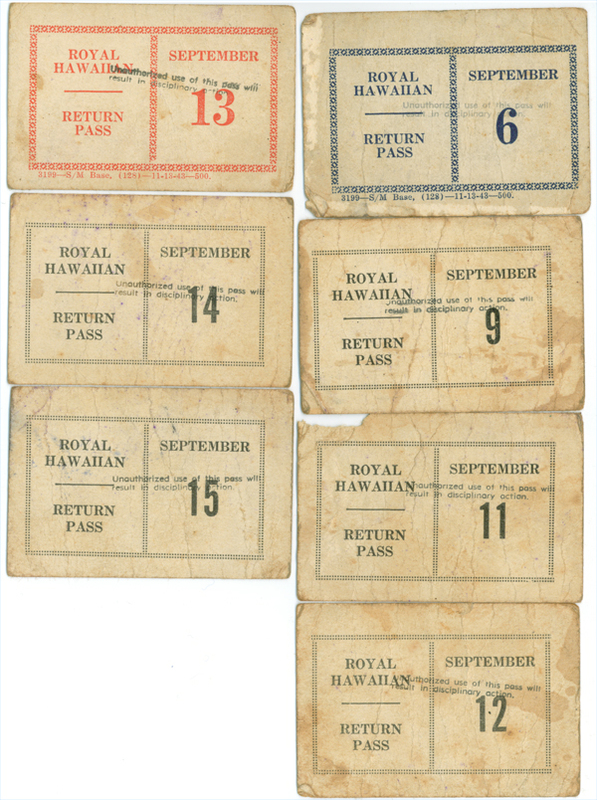 Training was conducted from September 20, 1944 until October 3, 1944, when they left Pearl Harbor for a refuel at Midway on October 6, 1944. 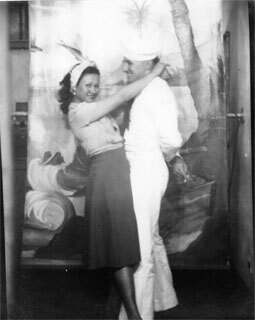 She left Midway on October 7, 1944 to conduct operations near the Bonin Islands for war patrol 12. 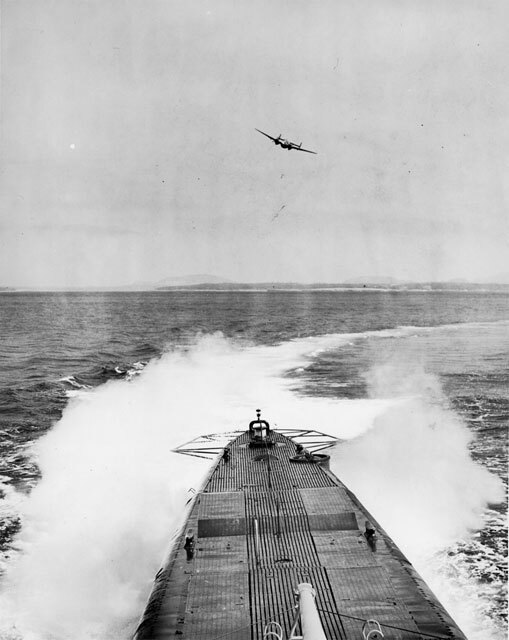 During that 12th and final patrol (between October 3 and November 30, 1944), the Tambor survived a tremendous depth charge attack on October 15, 1944. A total of 26 charges were counted within a 26 minute period while the Tambor sat on the ocean floor at 260 feet below. 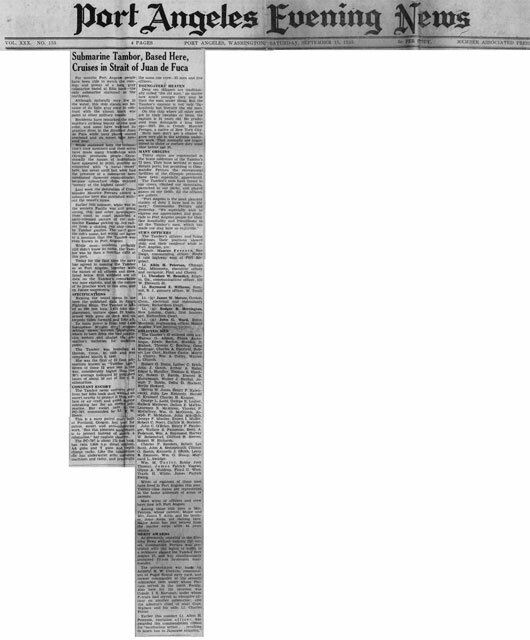 On top of that, the submarine was stuck at the bottom of the ocean and took nearly 2 hours to get surfaced again. What a story to tell! 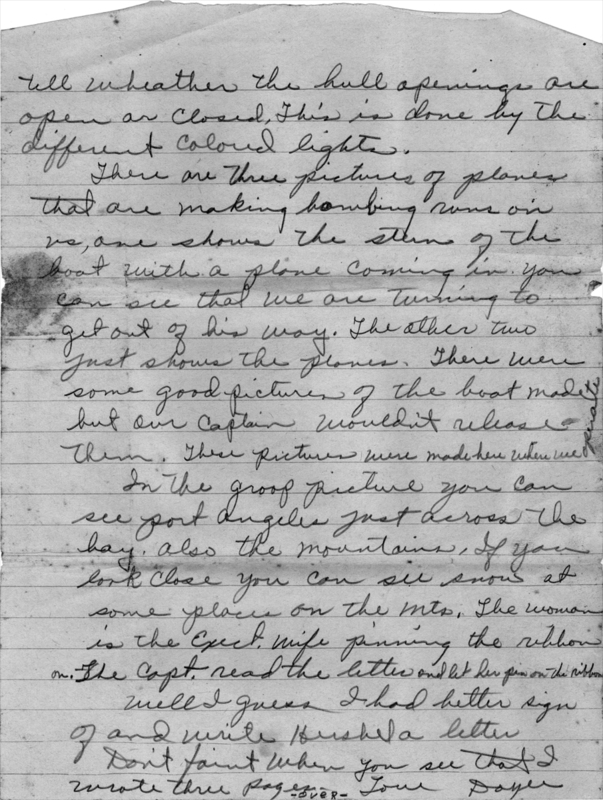 PLEASE CLICK HERE to read a detailed story of the Tambor's 12th war patrol as it was written by W.J. Germershausen, the commander of the Tambor for that patrol. 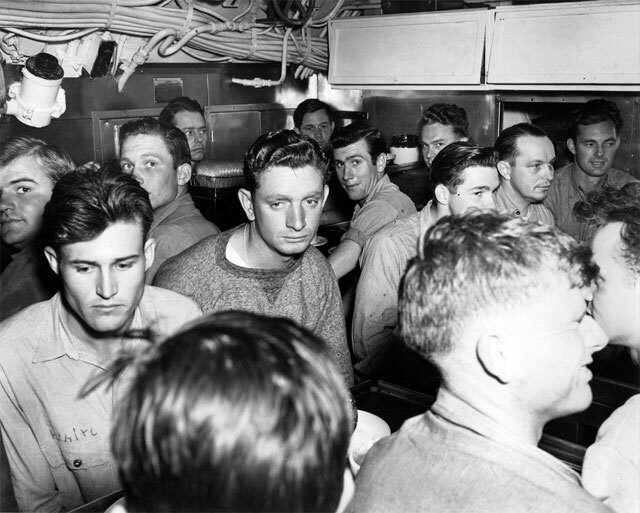 The picture above is from one of the final two war patrols of the USS Tambor. I personally believe it is from an attack during the 12th patrol on November 16, 1944. 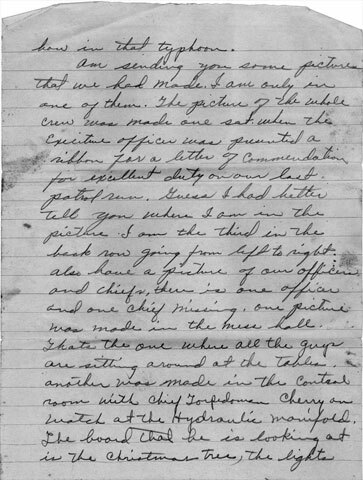 Patrol reports state the Tambor sank a wooden hull patrol vessel of 200-300 tons that was 175-200 feet long on that date and took 2 prisoners aboard while taking pictures. Here are his submarine stories, straight from Doyle on December 17, 1994. Enjoy all 6 parts! 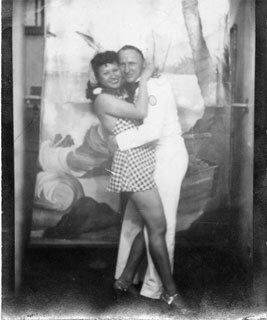 The Tambor finished her last war patrol at Pearl Harbor on November 30, 1944. She arrived at San Francisco, California, on December 10, 1944 for an extended overhaul. A total of 14 of her 24 torpedoes were expended and sank 5,500 tons of shipping and damaged 300 tons. A snazzy dance was held on February 16, 1945 for the Tambor. A Tambor veteran informed me that it was $25 to get in the door, and lots of alcohol and females were there. 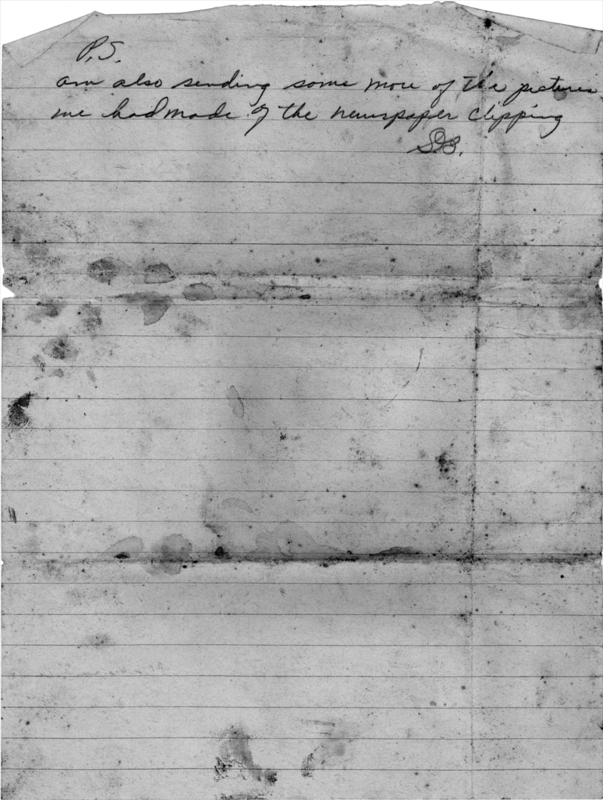 Above is a close-up of the roll. 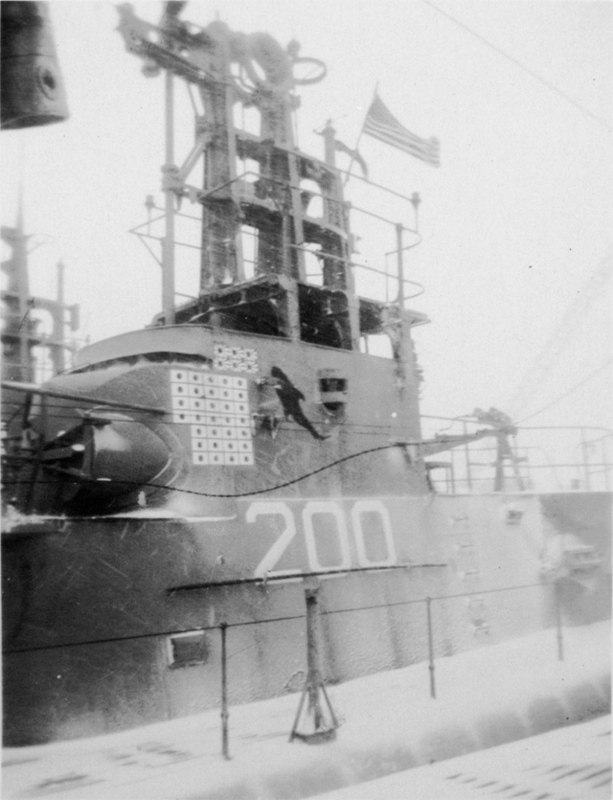 The USS Tambor and Doyle left San Francisco on March 9, 1945 for Puget Sound off the coast of Washington. There they helped train Navy patrol aircraft. 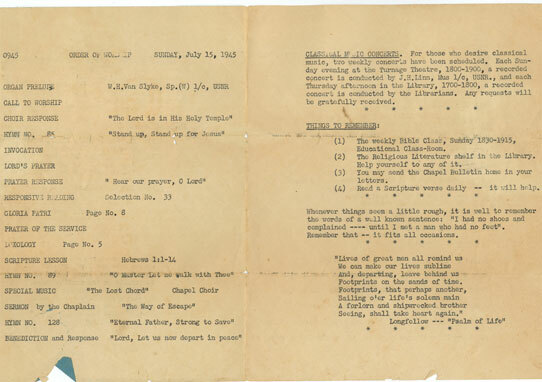 He attended a worship service on Sunday, July 15, 1945. 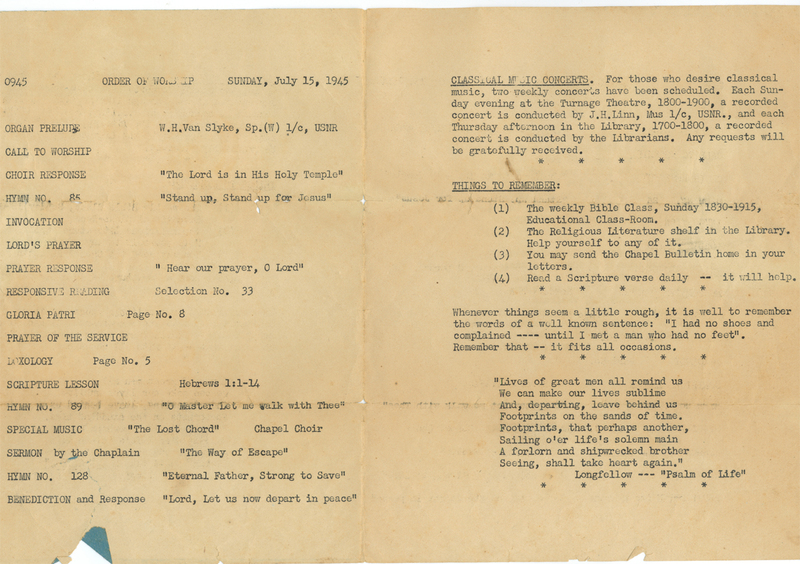 The images above are of the bulletin he kept from that day. The images above are of a four page letter Doyle wrote home to his folks on August 1, 1945. 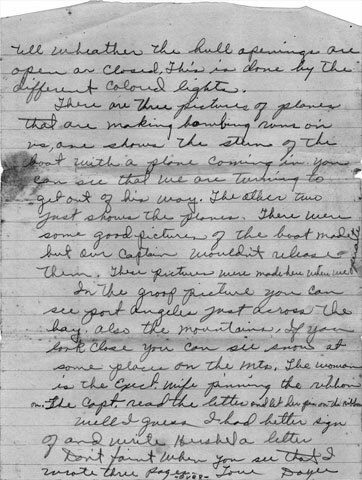 Here are the pictures he described in the letters. First one above, he is on the back row, third from the left. 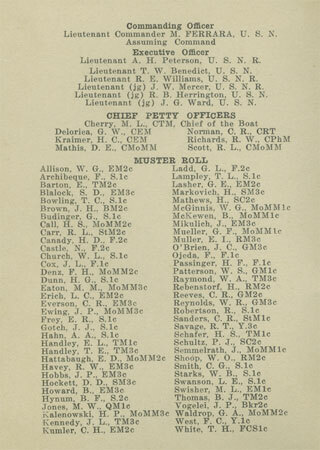 Above are the Tambor's officers and chiefs, with one of each missing. The Tambor's mess hall, packed full of sailors! Tambor's Chief Torpedoman Murry Cherry standing in front of the "Christmas Tree". Perhaps this is where my mother got her name? 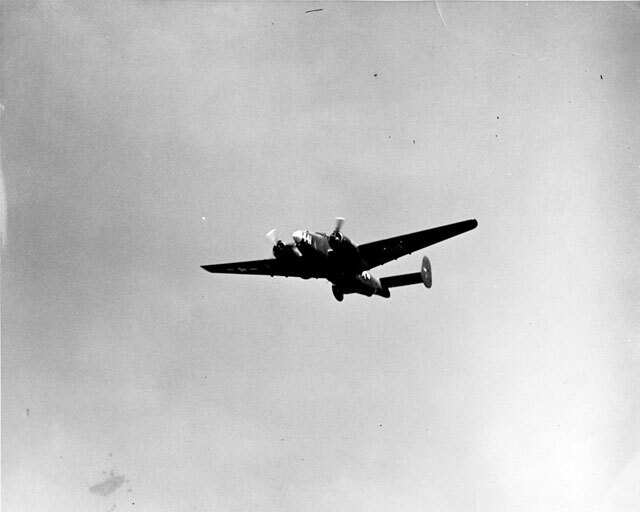 Amazing pictures of the US plane making practice bombing runs on the USS Tambor. And lastly, the officer getting a ribbon. Here's a newspaper clipping from the front page of the Port Angeles Evening News newspaper on September 15, 1945 all about the USS Tambor. On September 17, 1945, Doyle left Washington state aboard the USS Tambor headed for Portsmouth Naval Shipyard. 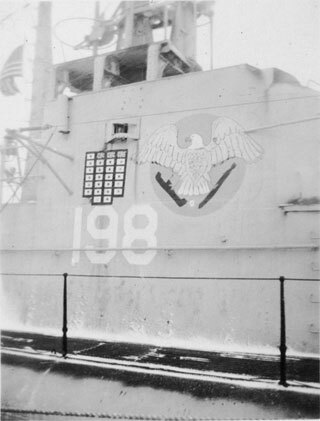 The USS Tambor, among other ships, was scheduled to be decommissioned there. 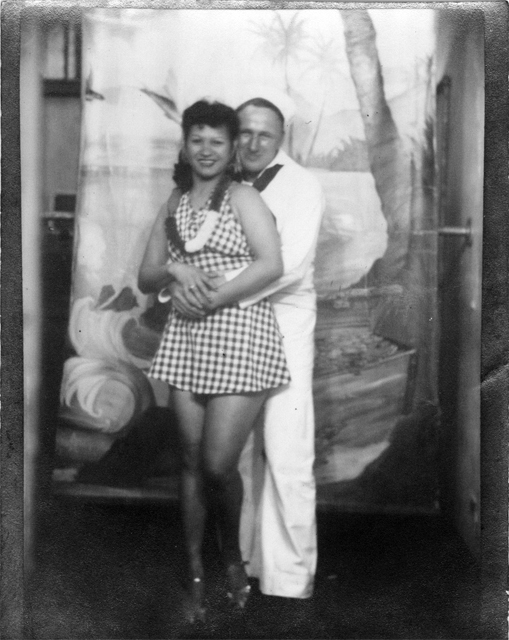 Those pictures must have been taken from Portsmouth Naval Shipyard sometime between October and mid-December, 1945. 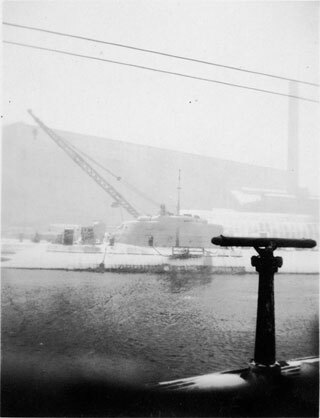 The USS Tambor (SS-198) near decommission time. 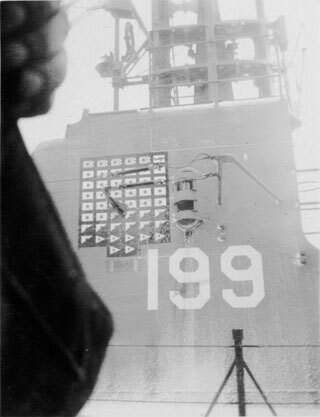 The USS Tautog (SS-199) near decommission time. 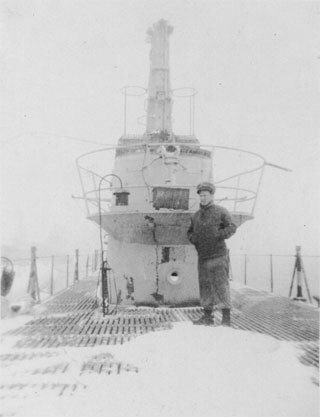 The Tautog was one of the few submarines in Pearl Harbor on the day it was attacked and earned the nickname "Terrible T" for the high number of ships she sunk. 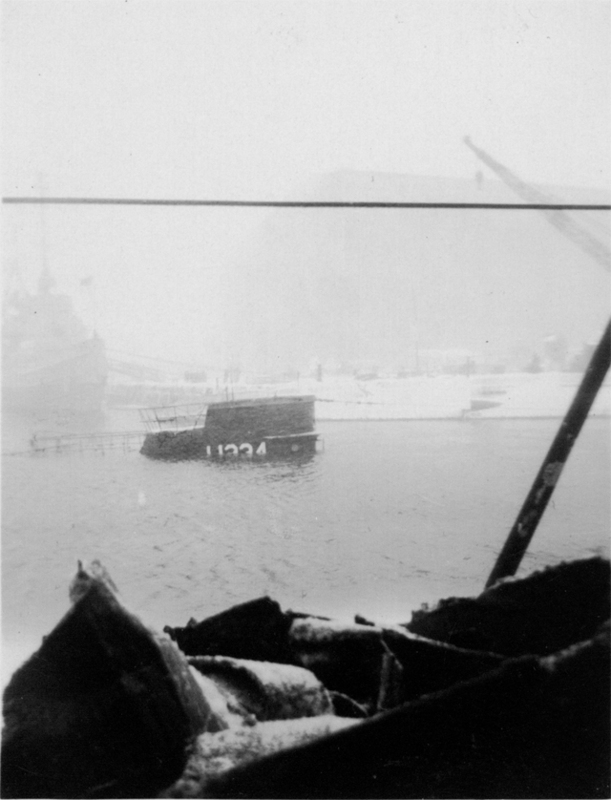 The USS Thresher (SS-200) near decommission time. The Tambor class submarine consisted of a total of 12 submarines, with the USS Tambor being the first of that class. 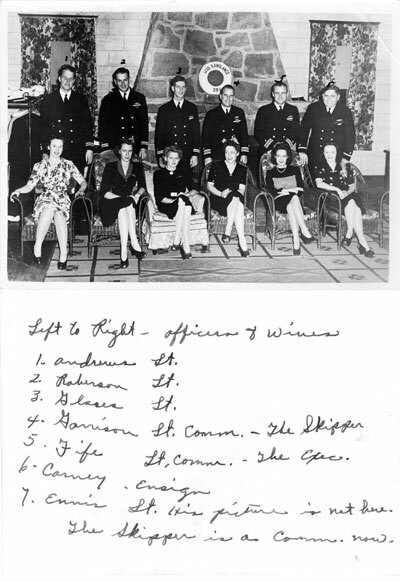 All 12 were active during WWII. Seven of those were lost in the war! 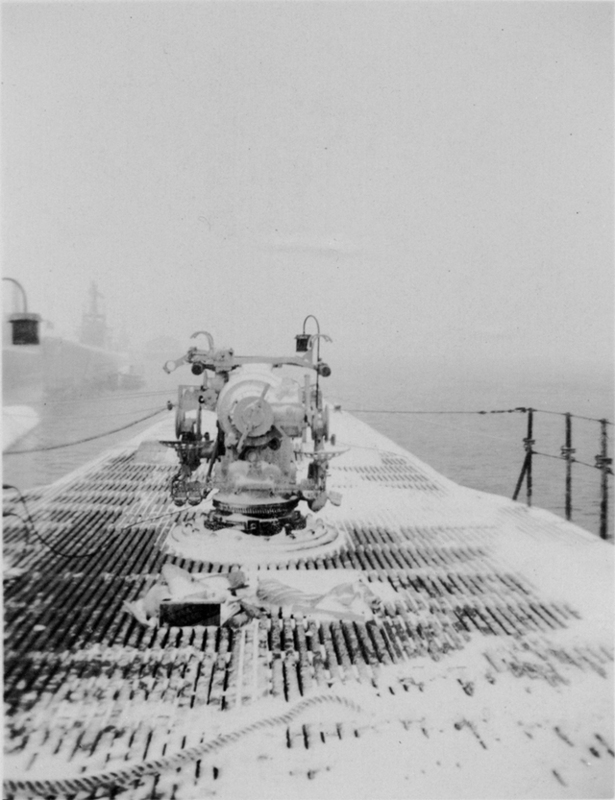 Four of the remaining five were decommissioned in Portsmouth in December of 1945. Three of those four are pictured above, with the USS Gar (SS-206) not being pictured. What a sad time it must have been for Doyle to have commissioned a brand new Balao-class submarine in December of 1943, only to return two years later on a much older Tambor-class submarine to be decommissioned. "When the U Boat was escorted into Portsmouth, New Hampshire and her secret cargo was uncovered, Robert Oppenheimer himself came on board and removed the cases marked U-235, plus papers and drawings. 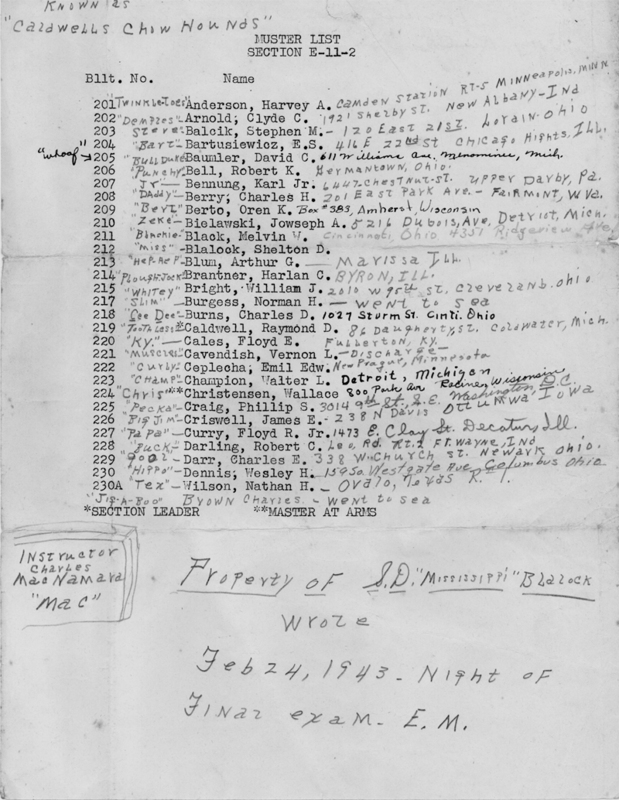 The Uranium carried by U-234 was allegedly enough to make two atomic bombs, 1235 pounds of 77 percent pure uranium oxide, it was destined for the Japanese atomic bomb program. 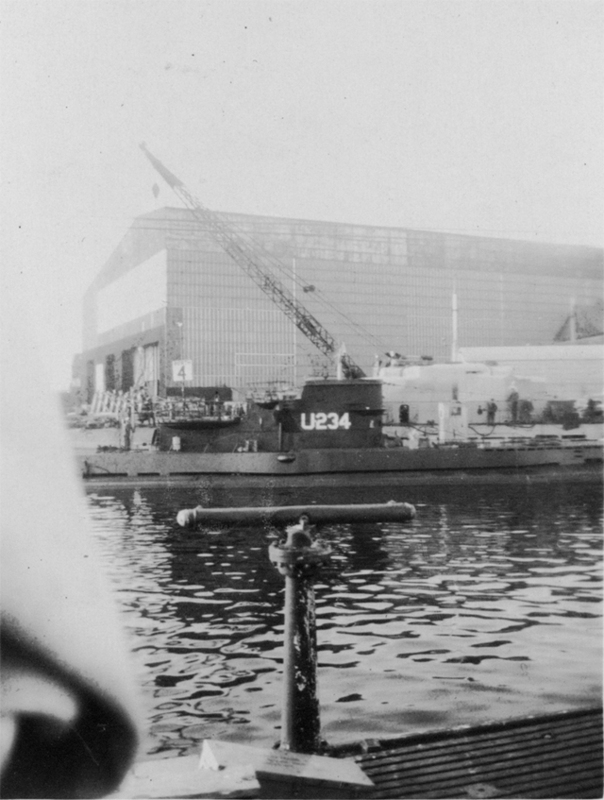 The U-235 (Uranium-235) was taken away to Los Alamos, forming part of the payload of the bomb that fell on Hiroshima. So, the uranium intended for the production of a Japanese Bomb arrived in due course, but in a way no person in Japan could have imagined in his wildest nightmares! 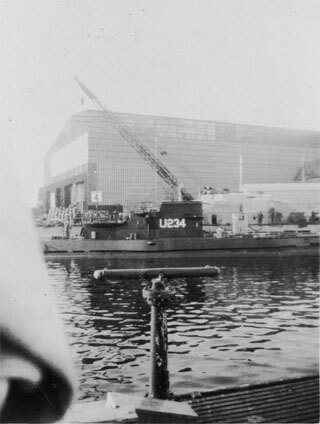 When the U Boat arrived in Portsmouth, it was placed under immediate armed guard and soldiers were ordered to shoot any reporter who tried to get near. They knew all right what they were dealing with." It's amazing that Doyle was able to take these pictures!! 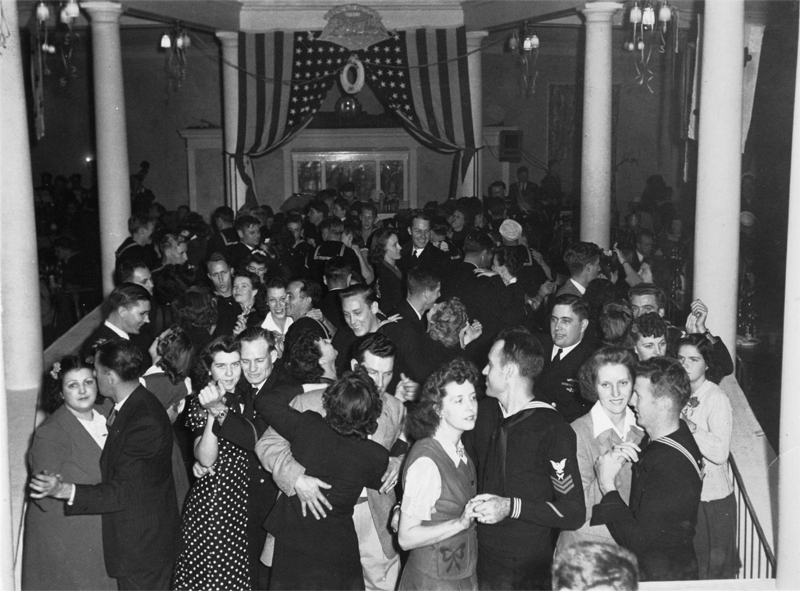 The USS Tambor was decommissioned on December 10, 1945, exactly a year after she had entered San Francisco, California, from her 12th and final patrol for an overhaul. 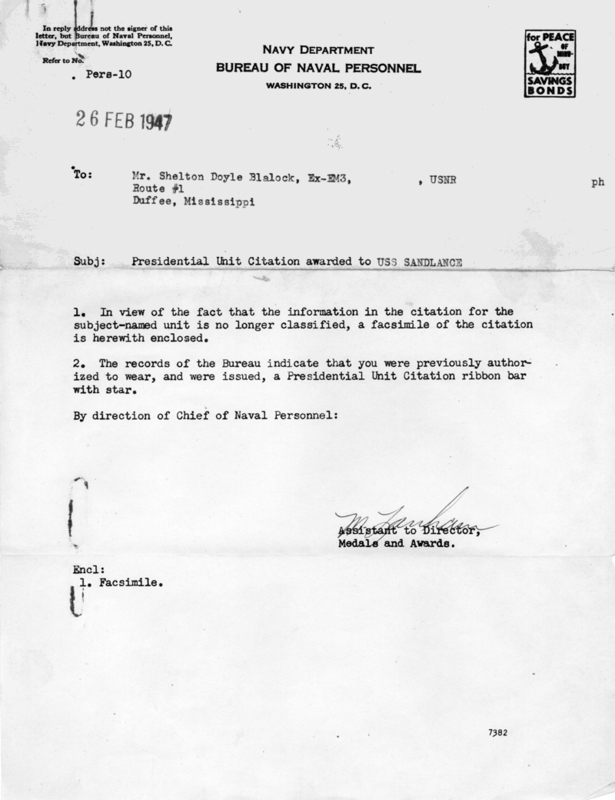 Doyle surely was there in Portsmouth that day. He was honorably discharged less than a week later on December 16, 1945. 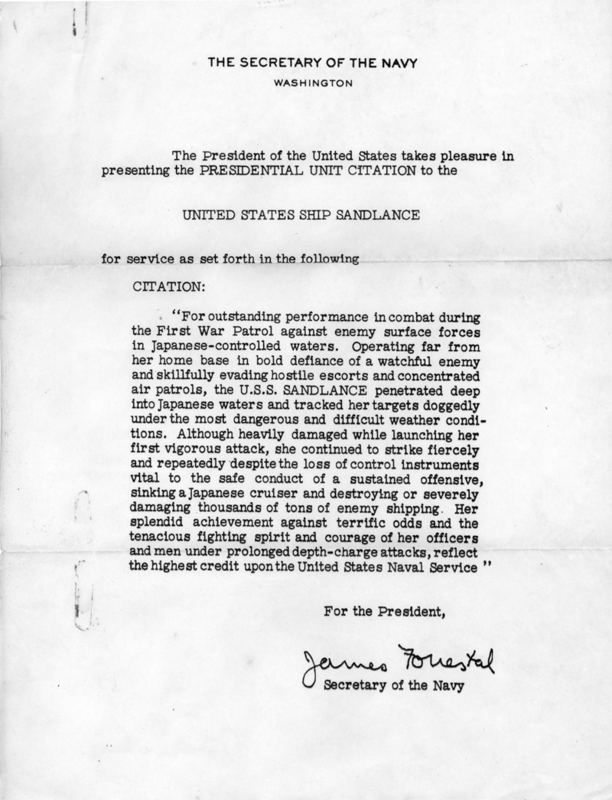 Doyle received a Presidential Unit Citation for the performance of the first war patrol of the USS Sand Lance. Even though he wasn't on the Sand Lance during combat, he still served and was a plankowner. This was a great honor! 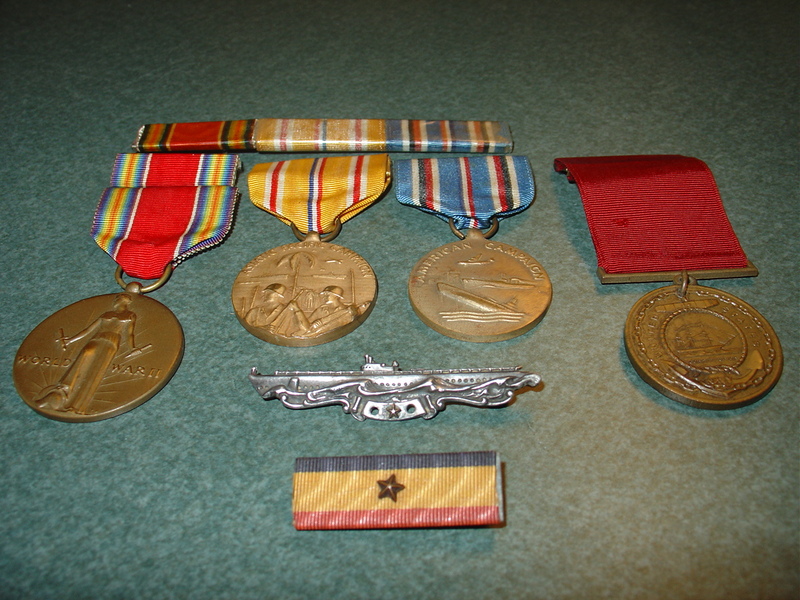 He also received 4 medals with their corresponding ribbons. Here they are! The World War Two Victory Medal, the Asiatic-Pacific Campaign Medal, the American Campaign Medal, and the Good Conduct Medal. You also see his Submarine Combat Patrol Pin with a bronze star, which signifies two successful patrols aboard a submarine (USS Tambor, war patrols 11 and 12). 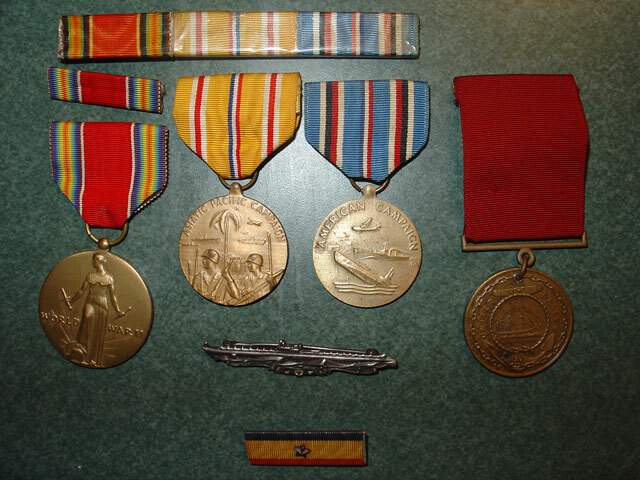 At the bottom-center is the Presidential Unit Citation ribbon with the bronze star in the middle (USS Sand Lance, war patrol 1). His Good Conduct Ribbon is missing and no one knows where it could be. Also his "Ruptured Duck" (Honorable Discharge) lapel button is missing. If his ribbons were complete and proper, this is how they SHOULD look. It looks like he carried this card a lot. 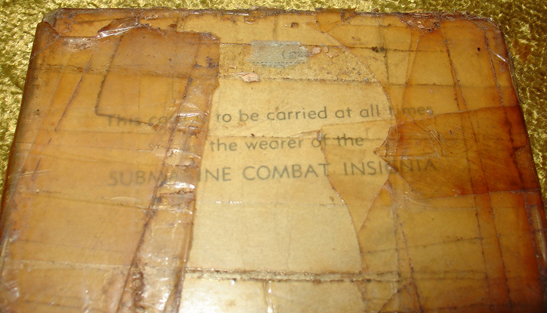 It was to verify his Submarine Combat Patrol Pin, the pride and joy of all WWII submariners who had been on successful combat patrols. Here is a table showing a summary of his service in the military. 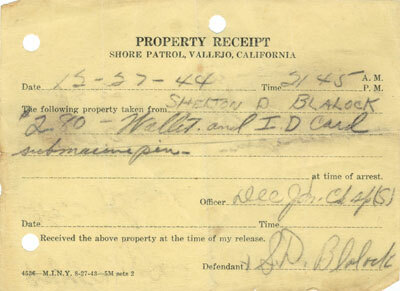 This was found after requesting a copy of his OMPF. The war was over, now what was Doyle to do?